What a memorable day! When you have the rare opportunity to catch up with people you haven’t seen for as many as 50 years, it is always going to be special. This momentous occasion was the brainchild of CLAMF President Paul Stein and his hard working band of merry men. It is fair to say the day surpassed all expectations with estimates of the crowd exceeding 100 people. 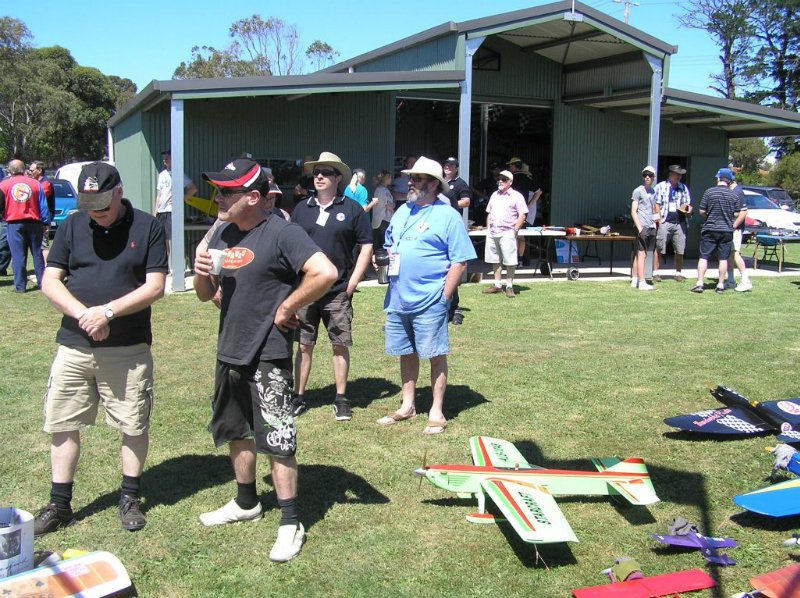 From around 10 am to 4 pm modellers past and present gathered together at the Frankston clubhouse, talked about old times and watched the non stop flying activities take place on the three pristine circles. The weather was near perfect with constant sunshine all day. The demonstrations included Speed, Aerobatics, Carrier Deck, Vintage Combat, F2D Combat, F2C, Classic FAI and special flights by Open Combat, Open Rat Race and Classic B models. Some of these flights were performed by 2010 F2C World Champion Mark Ellins and 2012 World Champs finalist, Murray Wilson. Master of Ceremonies Andrew Nugent gave the crowd informative commentaries on the portable loudspeaker about many of the events, especially Classic FAI team race. There were over 100 control line models on display and many an old modeler took a keen interest in checking them out and noting the changes since they were last involved. As this was Remembrance Day, all at the field observed one minute of silence to remember members of our armed forces who have died in the line of duty. There were models available for a fun fly and many former enthusiasts elected to have a go. One flyer that had not touched a handle for 30 years performed remarkably well. It is said control line flying is like riding a pushbike… you never really forget how to do it. If just one person is tempted to take up active control line flying again, then all the time and effort put into organizing this reunion will have been well worthwhile. All in all, it was great to get in touch again with old friends who were part of the control line scene all those years ago. This reunion was to be a one off but was so successful, it will be surprising if popular demand doesn’t dictate we hold another one at some point in time down the track.